Our present gathering in honour of the MostHoly Virgin inspires me, brethren, to say of Her a word of praise, of benefit also for those come unto this churchly solemnity. It comprises a praise of women, a glorying of their gender, which (glory) is brought it by Her, She Who is at one same time both Mother, and Virgin. O desired and wondrous gathering! Celebrate, O nature, that wherein honour be rendered to Woman; rejoice, O human race, that wherein the Virgin be glorified. "For when sin did abound, grace did superabound" (Rom. 5: 20). The Holy Mother of God and Virgin Mary hath gathered us here, She the pure treasure of virginity, the intended paradise of Second Adam, – the locus, wherein was accomplished the co-uniting of natures, wherein was affirmed the Counsel of salvific reconciliation. Whoever is it that ever saw, whoever heard, that within a womb the Limitless God would make habitation, Whom the Heavens cannot circumscribe, Whom the womb of a Virgin limiteth not!? He born of woman is not only God and He is not only Man: This One born made woman, being the ancient gateway of sin, into the gateway of salvation: where evil poured forth its poison, bringing on disobedience, there the Word made for Himself a living temple, bringing in thither obedience; from whence the arch-sinner Cain sprang forth, there without seed was born Christ the Redeemer of the human race. The Lover-of-Mankind did not disdain to be born of woman, since this bestowed His life. He was not subject to impurity, being settled within the womb, which He Himself arrayed free from all harm. If perchance this Mother did not remain a Virgin, then that born of Her might be a mere man, and the birth would be no wise miraculous; but since She after birth remained a Virgin, then how is He Who is born indeed – not God? It is an inexplicable mystery, since in an inexplicable manner was born He Who without hindrance went through doors when they were locked. When confessing in Him the co-uniting of two natures, Thomas cried out: "My Lord, and my God!" (Jn. 20: 28). The Apostle Paul says, that Christ is "to the Jews indeed scandal, and to the Gentiles yet folly" (1 Cor. 1: 23): they did not perceive the power of the mystery, since it was incomprehensible to the mind: "for had they understood, they would not have crucified the Lord of Glory" (1 Cor. 2: 8). If the Word had not settled within the womb, then the flesh would not have ascended with Him onto the Divine Throne; if for God it were disdainful to enter into the womb, which He created, then the Angels too would have disdained service to mankind. That One, Who by His nature was not subject to sufferings, through His love for us subjected Himself to many a suffering. We believe, that Christ not through some gradual ascent towards the Divine nature was made God, but being God, through His mercy He was made Man. We do not say: "a man made God"; but we confess, that God was incarnated and made Man. His Servant was chosen for Himself as Mother by That One Who, in His essence did not have mother, and Who, through Divine foresight having appeared upon the earth in the image of man, does not have here father. How one and the same is He both without father, and without mother, in accord with the words of the Apostle (Heb. 7: 3)? If He – be only a man, then He cannot be without mother – but actually He had a Mother. If He – be God only, then He cannot be without Father – but in fact He has the Father. And yet as God the Creator He has not mother, and as Man He has not father. 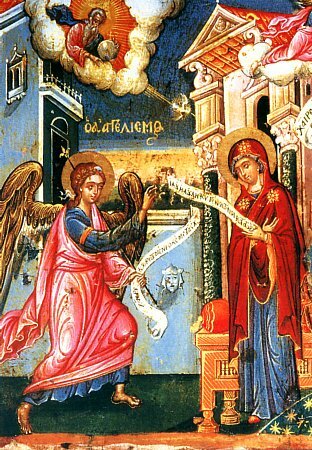 We can be persuaded in this by the very name of the Archangel, making annunciation to Mary: his name – is Gabriel. What does this name mean? – it means: "God and man". Since That One about Whom he announced is God and Man, then his very name points beforehand to this miracle, so that with faith be accepted the deed of the Divine dispensation. To save people would be impossible for a mere man, since every man has need in the Saviour: "for all, – says Saint Paul, – have sinned, and come short the Glory of God" (Rom. 3: 23). Since sin subjects the sinner to the power of the devil, and the devil subjects him to death, then our condition did become extremely hapless: there was no sort of way to be delivered from death. There were sent physicians, i.e. the prophets, but they could only the more clearly point out the malady. What did they do? When they saw, that the illness was beyond human skill, they summoned from Heaven the Physician; one of them said "Lord, bend the heavens, and come down" (Ps. 143 : 5); others cried out: "Heal me, O Lord, and I shalt be healed" (Jer. 17: 14); "restore Thine power, and come yet to save us" (Ps. 79 : 3). And yet others: "For if God truly be settled with man upon the earth" (3  Kings 8: 27); "speedily send before Thine tender mercy, O Lord, for we are brought very low" (Ps. 78 : 8). Others said: "O woe to me, my soul! For the pious art perished from the earth, and of the upright amongst men there is none" (Mich. 7: 2). "O God, in help attend to me, O Lord, shield me with Thine help" (Ps. 69 : 1). "If there be delay, endure it, for He that cometh shalt come, and not tarry" (Hab. 2: 3). "Perishing like a lost sheep: seek out Thine servant, who doth hope on Thee" (Ps. 118 : 176). "For God wilt come, our God, and wilt not keep silence" (Ps. 49 : 3). That One, Who by nature is Lord, did not disdain human nature, enslaved by the sinister power of the devil, the merciful God would not accede for it to be forever under the power of the devil, the Ever-Existing One came and gave in ransom His Blood; for the redemption of the race of man from death He gave up His Body, which He had accepted of the Virgin, He delivered the world from the curse of the law, annihilating death by His death. "Christ hath redeemed us from the curse of the law", – exclaims Saint Paul (Gal. 3: 13). Thus know, that our Redeemer is not simply a mere man, since all the human race was enslaved to sin. But He likewise is not God only, non-partaking of human nature. He had body, since if He had not clothed Himself in me, He then likewise should not have saved me. But, having settled within the womb of the Virgin, He clothed Himself in my fate, and within this womb He perfected a miraculous change: He bestowed the Spirit and received a body, That One only indeed (dwelling) with the Virgin and (born) of the Virgin. And so, Who is He, made manifest to us? The Prophet David doth point it out for thee in these words: "Blessed is He that cometh in the Name of the Lord" (Ps. 117 : 26). But tell us even more clearly, O prophet, Who is He? The Lord is the God of Hosts, says the prophet: "God is the Lord, and hath revealed Himself unto us" (Ps. 117 : 27). "The Word was made flesh" (Jn. 1: 14): there were co-united the two natures, and the union remained without mingling. He came to save, but had also to suffer. What has the one in common with the other? A mere man cannot save; and God in only His nature cannot suffer. By what means was done the one and the other? Wherein that He, Emmanuel, being God, was made also Man; both this, that what He was, He saved by, – and this, that what He was made, He suffered as. Wherefore, when the Church beheld, that the Jewish throng had crowned Him with thorns, bewailing the violence of the throng, – it said: "Daughters of Zion, go forth and behold the crown, of which is crowned He of His mother" (Sng. 3: 11). He wore the crown of thorns and destroyed the judgement to suffering from the thorns. He Only is That One both in the bosom of the Father and in the womb of the Virgin; He Only is That One – in the arms of His Mother and in the wings of the winds (Ps. 103 : 3); He, to Whom the Angels bowed down in worship, at that same time reclined at table with publicans. Upon Him the Seraphim dared not to gaze, and at the same time Pilate pronounced sentence upon Him. He – is That One and Same, Whom the servant did smite and before whom did tremble all creation. He was nailed to the Cross and ascended to the Throne of Glory, – He was placed in the tomb and He stretched out the heavens like a skin (Ps. 103 : 2), – He was numbered amidst the dead and He emptied hell; here upon the earth, they cursed at Him as a transgressor, – there in Heaven, they exclaimed Him glory as the All-Holy. What an incomprehensible mystery! I see the miracles, and I confess, that He – is God; I see the sufferings, and I cannot deny, that He – is Man. Emmanuel opened up the doors of nature, as man, and preserved unharmed the seal of virginity, as God: He emerged from the womb thus as He entered through the announcing; the same wondrously was He both born and conceived: without passion He entered, and without impairment He emerged, as concerning this doth say the Prophet Ezekiel: "He returned me back the way of the gates of the outer sanctuaries, looking upon the east: and these had been shut. And saith the Lord to me: son of man, these gates shalt be closed, and not open, and no one go through them: for the Lord God of Israel, He Only, shalt enter and come forth, and they wilt be shut" (Ez. 44: 1-2). Here – it clearly indicates the Holy Virgin and Mother of God Mary. Let cease all contention, and let the Holy Scripture enlighten our reason, so that we too receive the Heavenly Kingdom unto all eternity. Amen.